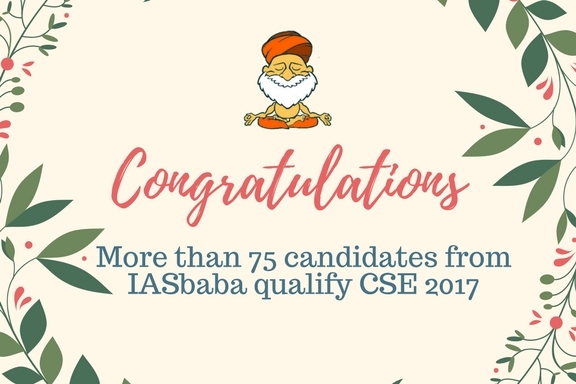 This year more than 75 plus (and counting) students of IASbaba have made into the final merit list of CSE. They belong to our offline and online initiatives (contact/outreach programs). For example, Rank 14, 19, 23, 26, and many more were ILP students. If we start incorporating the candidates who have followed our free initiatives like 60 Day, TLP, TRP or even used IASbaba resources available in the market, the list would be a never-ending one. But we won’t do that of course. However, as a matter of fact, we have been receiving many emails from such followers thanking us for the role that IASbaba has played in their success. We acknowledge and appreciate their gesture. 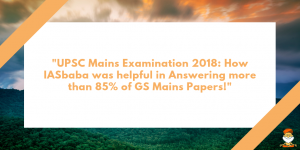 In mere 3 years, if IASbaba has come up to be one of the most sought in the entire ecosystem of UPSC preparation both online and offline combined, these results and faith among aspirants have held us high. Here is the rank wise list of the successful candidates from IASbaba. We congratulate you for your grand success and wish you a great future ahead. The real journey begins here from here. You have at least 30 years of career in front of you to serve the country and make India a true global power. In whatever capacity you work in, your contribution would add to the grand nation-building project that has been going on since independence and would continue even after you retire. Moreover, you have all become the role models for the young generation as your success is rare. Whatever you do, always keep in mind one thing- people who look upon are watching you closely. Your actions and inactions can inspire or stifle the motivation of thousands of youngsters. We would also like to thank you for making IASbaba proud. You have proven that with the right guidance and sincere efforts, anything is possible. You have not only strengthened the faith of thousands of followers in IASbaba but also motivated many to explore our platform with even more sincerity and consistency. We have grown stronger because of you and we thank you from the core of our hearts. For those, who couldn’t qualify this time, there is no time to lose heart or go into hiding from the world. Failure isn’t the antonym of success. It is a stop on your way towards success. The journey to excellence is a never-ending one for ‘excellence’ can never be defined or precisely quantified. You would have seen that already in the trend of results declared by UPSC in the last 5 years. Each year, new milestones are being created by the toppers. Cut-offs are increasing each year and so does the benchmark to achieve ‘excellence’ in one’s efforts towards success. Even though it feels eternity since we collaborated to create a platform called ‘IASbaba’, it is only our 3rd year. However, these three years have been so eventful for us. We have achieved unprecedented milestones and are doing better with each passing day. We understand that we have to work even harder to even maintain the standards that we have created but we promise that you will keep on seeing our better versions in the days to come. In return, we expect only one thing from you- sincerity and consistency.